It’s a fact – visually appealing, interactive presentations are much better way to help the communicator convey his core ideas and for an audience to grasp it. If the presentation is interactive, that is even better. Says Lane, “rather than limiting yourself to a single large, linear slide show, you create a network of small, reusable shows.” According to Wikipedia, Relational presentations were first created in the late 1990’s in the University of Arizona by in a research project conducted by Dr. C. June Maker. These techniques of such a presentation were refined by the author of the article mentioned above – Robert Lane. 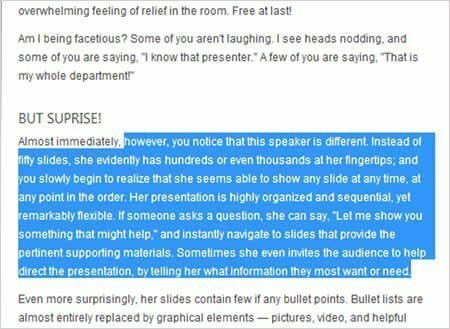 There are very few examples of a Relational presentation as this technique is unconventional and not widely known. We would love to hear your thoughts on this technique. Have you ever made a presentation like this? Attended a presentation that used this format? Share your thoughts with us in the comments section! Would you like us to design a PowerPoint presentation for you? Try our PowerPoint makeover services!